on the fifth most common cancer! We will bring more information about the campaign soon. Please, download your Bladder Cancer Campaign Toolkit here. Blood in your urine is the the most common symptom of bladder cancer. It can be obvious when clearly visible to the eye (when your urine is bright red, rusty or pink) but sometimes it can be invisible and can only be found by your doctor by testing a sample of your urine. Blood in your urine is also a symptom of many less serious medical conditions so further tests will be needed to make a diagnosis. Very few people will experience all the symptoms. You may only experience one of these symptoms with your particular cancer. If you are in any doubt about your symptoms talk to your doctor. Smoking is the by far the largest preventable cause of bladder cancer, so, if you haven’t given up yet, do it now. Even at this stage, it can massively help your recovery. Other risk factors include certain genetic conditions, urinary infections, kidney and bladder stones, and some chemicals at work. In some cases we can't identify the cause, because not enough is known about the disease. 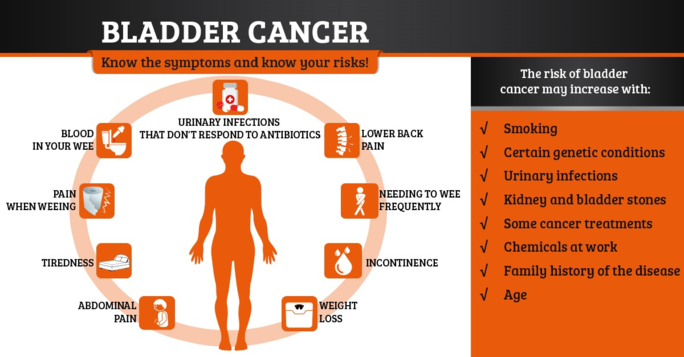 Bladder cancer is commonly separated into slow-growing, non-muscle invasive cancers, fast-growing muscle invasive cancers, and metastatic cancer. Non-muscle invasive bladder cancer can be called ‘early-stage bladder cancer’ – this is when the cancer is found to be limited to the bladder surface and hasn’t spread elsewhere. Muscle invasive bladder cancer is when the cancer has spread deeper into the bladder itself, or even through the wall of the bladder into adjoining organs. Cancer that has spread to other parts of the body is called metastatic bladder cancer.